Timothy Gowers' excellent post details his research looking for Elsevier pricing mechanisms and actual prices paid by university libraries through FOI requests. Lots of useful data noted here for future number-crunching. Brian Matthews at Ubiquitous Librarian has calculated that it would cost the U.S. about $91 billion to purchase Elsevier Universal Access for everyone in the U.S. By my calculations, this move would have little to no impact on Elsevier costs, therefore increasing Elsevier's global STM revenue 25-fold and increasing their profit margin from 39% to 98.6%. Following are my calculations. Elsevier's Universal Access is their corporate alternative to open access - the vision where open access is not necessary, because everyone on the planet is covered by an Elsevier subscription. Brian Matthews at Ubiquitous Librarian estimates that a U.S. national subscription to Elsevier Universal Access for the U.S. would cost $91 billion U.S. That's 25 times Elsevier's global STM revenues of approximately $3.7 billion U.S. (based on $2.2 million UK pounds converted at today's rate as quoted by Bank of Canada). That $3.7 billion U.S. already accounts for a 39% profit margin. Universal Access for everyone in the U.S. would likely have little to no impact on Elsevier's costs (those who really need the journals already subscribe, and any slight increase in usage costs is likely to be more than offset by a decrease in technical support and sales costs). If Matthew's calculations are correct, this would mean that Elsevier profits would increase from $1.3 billion U.S. (based on 826 million GBP) would increase to approximately $89.7 billion U.S., a profit rate of 98.6%. Please note that there an issue with this URL has been resolved. Double kudos to the Directory of Open Access Books (DOAB) for taking the two highest places for quarterly growth as measured in percentage. 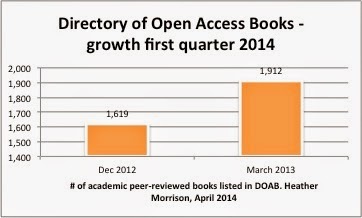 DOAB added 293 open access monographs this quarter for an 18% growth rate (annual equivalent 72%) and a total of 1,912 books as of March 31, 2014. DOAB also added 8 new publishers for a 15% quarterly growth rate (annual equivalent 60%) and a total of 62 publishers. I hope my small contribution of faculty library start-up funds to the Knowledge Unlatched pilot helped with this! This quarter's data has a few indicators which suggest an increased tendency for traditional society publishers to move to open access. Highwire Press' completely free sites had the third highest growth by percentage this quarter, adding 10 journals for an 11% quarterly growth rate (annual equivalent 44%) and a total of 99 titles. 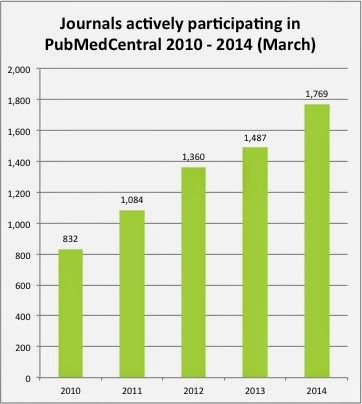 PubMedCentral staff have obviously been very busy this quarter, enough to take up a third of the top 15 spots by quarterly growth rate for journal participation alone (PMC free article growth has its own worksheet). 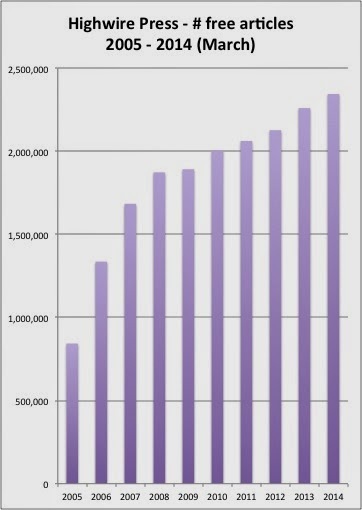 PMC indicators that grew by more than 5% this quarter (20% annual equivalent) include the number of journals with some articles open access (up 8% / 23 journals to 310 journals), the number of journals with immediate free access (up 5% / 64 journals to 1,252 journals), the number of journals that deposit ALL articles in PMC (up 5% / 68 journals to 1,462 journals, the number of journals with all articles open access (up 5% / 49 journals to 1,070 journals), and the number of journals actively participating in PMC (up 5% / 79 journals to 1,769 journals).